Baga qee'e Hawwaasa Oromoo Swiss nagaan dhuftani! The Oromo make up a significant portion of the population occupying the Horn of Africa, HOA. In the Ethiopian Empire alone, Oromo constitute about 40 million of the 80 million inhabitants of the Ethiopian Empire. Oromo is one of the most numerous nations in Africa which enjoys a homogeneous culture and shares a common language, history and descent and once shared common political, religious and legal institutions. During their long history, the Oromo developed their own cultural, social and political system known as the Gadaa system. It is a uniquely democratic political and social institution that governed the life of every individual in the society from birth to death. The Gada was based on democratic principles. Election used to take every eight years. The main criteria for election to office included bravery, knowledge, honesty, demonstrated ability, and courage.The Gada system is the pillar of Oromo culture and civilization, and it helped the Oromo Society to develop democratic, political, economic, social and religious institutions for many centuries. Ecologically and agriculturally Oromia (Oromo country- Biyya Oromo) is the richest region in the Horn of Africa. Holidays generally follow the Christian, Muslim and Waaqeffataa holiday schedule. Traditional Oromo religion celebrates a thanksgiving (Irreecha) festival in September. 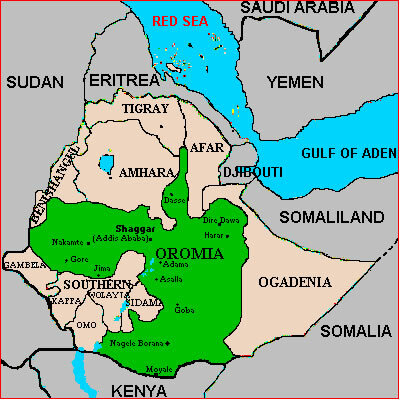 Oromia lies within the tropical climate zone. However, large part of oromia experience cooler temperature conditions because of its highst altitud. Large part of oromia gets summer rain fall except the south and southeaster low land areas which receive during the winter season. The geological structure of oromia is dominated by volcanic, that is the great east Africa rift valley system that disects oromia. The major foods of Oromos are animal products including foon (meat), aannan (milk), baadu (cheese), dhadha (butter), and cereals ( marqa (porridge) and buddeena (bread)). The special dish of Oromos is ittoo (made with meat or chicken, spices, hot pepper, and other ingredients) and bideena bread (made from xafi or millet). Oromos drink daadhi (honey wine), and faarso (home made beer). Agriculture (Coffee, several crops,Vegetables, spices) and animal husbandry; mining industry; tourism trade; medium and small - scale industries.